OAKLAND — Suspended Sgt. 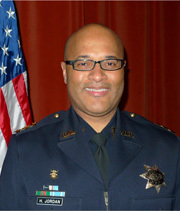 Derwin Longmire was the wrong person to lead the investigation of the 2007 killing of journalist Chauncey Bailey, acting Oakland police Chief Howard Jordan said Thursday. Longmire, who faces termination for his role in the Bailey case, was known to have a relationship with Your Black Muslim Bakery leader Yusuf Bey IV, who was indicted Wednesday for ordering Bailey’s killing. Jordan said he changed his view on the matter after reading recently completed reports from both the department’s Internal Affairs Division and state Attorney General Jerry Brown’s office. “I was aware of what they were investigating, but until they presented me with some factual information about his performance, I wasn’t going to make a judgment on him until that point,” Jordan said Thursday, the day after a grand jury indicted Bey IV. Jordan had issued a statement in October defending Longmire, stating that veteran detective did nothing wrong in the Bailey case — well before the internal affairs probes concluded. Longmire’s attorney, Michael Rains, said Thursday that Jordan was “blowing in the wind instead of standing up” for Longmire. Brown’s office this week rejected a Public Records Act request for documents detailing its findings against Longmire. The detective’s relationship with Bey IV and other members of the bakery was an open secret in the Police Department. He was assigned to Bailey’s killing before a ballistics test linked shotgun shells next to the victim’s body to another shooting in which police suspected bakery members. When bakery dishwasher Devaughndre Broussard was seen throwing the shotgun out a window during a raid the next day, Longmire used Bey IV to help persuade Broussard to confess to killing Bailey. But Longmire didn’t appear to pursue evidence that suggested the involvement of Bey IV. Longmire didn’t include in his case notes a tracking device report that showed Bey IV’s car had been parked outside Bailey’s apartment less than seven hours before the killing. The case notes also don’t include any reference to a clandestinely recorded police video in which Bey IV mocked Bailey’s killing and bragged that his friend Longmire was protecting him from charges. Longmire also took calls from Bey IV in jail last year, saying in one that he didn’t care about criticism of the relationship. At the time, Bey IV was facing a host of charges ranging from kidnapping and torture to assault with a deadly weapon. In a search warrant affidavit he used to obtain Bey IV’s cell phone records, Longmire wrote that he believed Bey IV was involved in Bailey’s killing. But after obtaining the phone records, Longmire documented no analysis of them. Rains acknowledged Longmire’s case notes were incomplete. “I can understand the criticism for the case notes being skimpy, but that was because Longmire and the rest of the homicide detectives (were) extremely overworked. He had to prioritize his time,” Rains said. A member of law enforcement familiar with the case but who is not authorized to speak to the media, said that ample evidence of Bey IV’s involvement in a conspiracy to kill Bailey existed from the start of the investigation and “any other detective” could have presented a chargeable case against the bakery leader with a few days of hard work. Longmire wasn’t among the more than a dozen witnesses who testified before the grand jury that indicted Bey IV, Broussard and another man, Antoine Mackey, in Bailey’s killing. Broussard is expected to plead guilty to lesser charges next week in exchange for cooperating with authorities. Longmire is “too tainted” to have any value as a witness, former Santa Clara County Superior Court Judge LaDoris Cordell said. Homicide investigator Sgt. Louis Cruz, whose work has not been questioned, also was not among the grand jury witnesses. Cruz conducted the Wills and Roberson investigations and assisted in the Bailey case. Cordell said the grand jury investigation of the killing of Bailey and two others, Odell Roberson and Michael Wills, “was very thorough and complete,” and that prosecutors should receive high marks for it. Thomas Peele and Kelly Rayburn are reporters for Bay Area News Group. Reach them at Tpeele@bayareanewsgroup.com and Krayburn@bayareanewsgroup.com. Bob Butler and Mary Fricker are independent journalists who can be reached at bobbutler7@comcast.net and Maryfricker@hughes.net. To learn more about the Chauncey Bailey Project go chaunceybaileyproject.org.